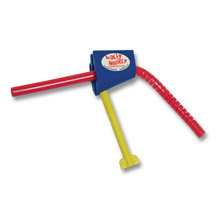 Turn straws into FUN with the Wacky Whirly™ straw cutting tool! Make bracelets, necklaces, wacky creatures, dangly mobiles, decorative spirals, and more! Straws will never look the same again! Colors may vary. We've added the option of getting a dozen straws with your straw cutter! Two each of six colors. NEED the INSTRUCTIONS on how to use your straw cutter? Here is a printable pdf file!